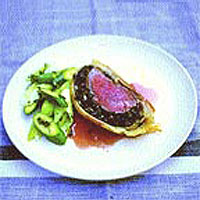 Wrapping the beef in pancakes helps to keep the pastry crisp, as does putting the Wellington onto a heated baking sheet. Heat a pan over a high heat. Add 2 tbsp oil. Season the beef, add to the pan and sear quickly - about 30 seconds each side. Set aside to cool. Finely chop the mushrooms in a processor. Heat a frying pan on a high heat, add the mushrooms and cook until all the moisture evaporates (10-15 minutes). Add the cream, season, and set aside to cool. Beat one egg with the flour until smooth. Slowly add the milk to form a batter. Heat an 18cm non-stick frying pan over a high heat, add a tiny amount of oil, then pour in a quarter of the batter. Swirl around to form a pancake. Cook for a minute each side. Remove and leave to cool. Repeat with the remaining batter. Roll the pastry into a 20cm square and put in the fridge to chill. When all the ingredients are cold, preheat the oven to 200°C/gas 6. Put a baking tray in the oven to heat. Beat the other egg. Take the beef, top with the mushroom mix and wrap the whole thing in pancakes (you may not need all four). Put the 'package' in the middle of the pastry and fold as if wrapping a gift. Turn so that the fold is underneath, put on the hot baking sheet and glaze with the egg. Cook for 35 minutes. Rest for 10-15 minutes before slicing and serving.